I was watching the football game a while back. One of the players had a broken hand and bruised ribs. He's a big offensive lineman and wasn't expected to play. The trainers wanted him to sit it out, but he wasn't about to miss the game. He had a big cast on his arm. He was wearing a special vest to protect his ribs. He was all bandaged up. He looked like a mummy. A reporter asked him how he felt. He said, "It's a little painful, but I'd rather be in the game in pain than sitting on the sidelines watching." If you're going to become all God has created you to be, you can't let that injury, that hurt, that disappointment, that setback cause you to sit on the sidelines of life. You might need to take some time out, but do like this player. Bandage up what's hurting. Forgive the person who did you wrong. Let go of what didn't work out and get back in the game. I saw a lady in our lobby one day that I hadn't seen for a long, long time. She's an older woman, very faithful. I said to her in passing, "Hey! I haven't seen you lately. Where have you been?" She said, "Joel, I had to have emergency surgery, and I've been in the hospital for three months." I said, "Wow! We're so glad to have you back. How are you doing?" For as long as I live, I will never forget her words. She said, "I'm hurting, but I'm here." Friend, that's the kind of people God rewards. Faithful people, people who are determined; people who get knocked down but don't stay down. You don't let the hurt, the pain, the bad break cause you to get bitter, lose your passion or start blaming God. No, like this lady, you stay in the game. No matter what life deals our way, our attitude should be, "I'm hurting, but I'm still here. A friend did me wrong, but I'm still here. Business is slow, but I'm still here. I didn't feel like coming, but I'm still here." You've got to have a made up mind that you're going to stay in the game. You're not only going to be faithful as long as you feel perfectly well, as long as everybody treats you right, as long as it's sunny and cool outside. No, you've made up your mind, "I'm hurting, but I'm still coming. My boss did me wrong, but I'm still getting to work on time; I'm still being my best. My child won't speak to me. It's breaking my heart. I'm in pain, but I'm still singing in the choir. I'm still ushering each week. I'm still being good to a friend that's in need. I've still got a smile. I'm still giving God praise." Anybody can sit on the sidelines. Anybody can find an excuse to be sour, to drop out, to give up on life. I'm asking you to stay in the game and let God lead you to victory! Joel Osteen is a native Texan and the Pastor of Lakewood Church, which according to Church Growth Today is America's largest and fastest growing church. 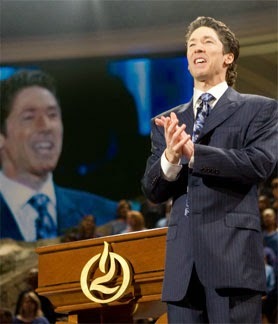 On July 16, 2005 after completing $95 million dollars in renovations, Joel moved Lakewood Church into its new 16,000-seat home - the former Compaq Center. It is the largest regularly-used worship center in the United States. Each week Joel delivers God's message of hope and encouragement to more than 38,000 attendees. According to Nielsen Media Research, Joel is the most watched inspirational figure in America. His weekly sermon is broadcast into every U.S. television market where it is viewed by seven million Americans each week and more than 20 million each month. His weekly broadcast is also seen in almost 100 nations around the world.